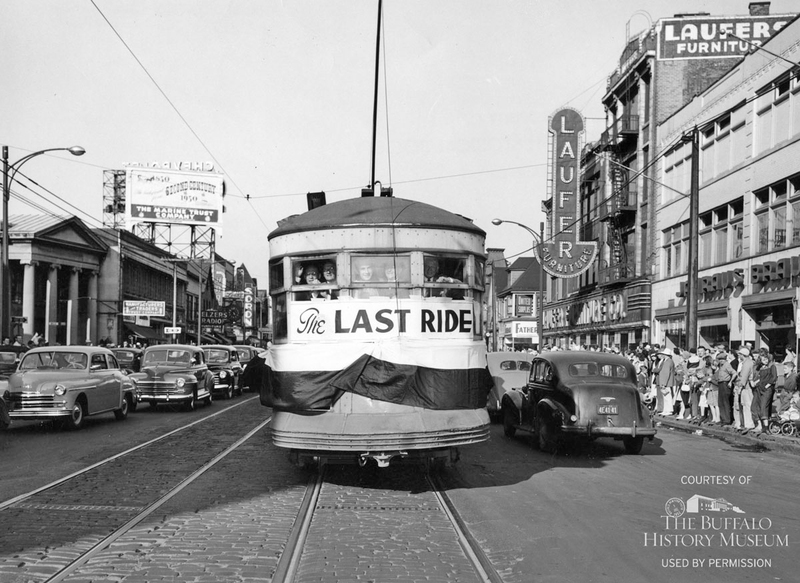 The dismantlement of the streetcar industry after World War II was an event that took place at the same time in nearly every American city. The International Railway Co. (IRC), established in 1902, operated the network of streetcar lines that served Buffalo, Niagara Falls, Lockport, and the suburbs. By 1930, this network included more than 900 streetcars on a staggering 415 miles of track. The conversion from streetcar to “modern buses” began in 1935 as a cost-saving measure, a prelude to the IRC’s declaration of bankruptcy in 1947. By 1950, when Niagara Frontier Transit, Inc., took over the system, only six streetcar lines remained in operation. The remaining 175 streetcars were brought to a depot on Military Road, disassembled, and burned.